Pools represent a great value-adding feature to any home and at the same time provide fun and relaxing times to be enjoyed by family and friends, in particular when it gets hot. However, it is of critical importance that the pool remains a safe place at all times, specially if children are around. Pool alarms are created with safety in mind and are designed to sound an audible alarm when something relatively heavy like a child or pet falls into the pool. The best pool alarms you can install today use reliable wave detection technology. When the wave caused by something or someone falling into the pool touches the sensor of the pool alarm, an alarm is triggered, emitting a clear warning signal at the pool as well as on the remote receiver. Not all pool alarms are equipped with remote receivers, and we definitely recommend to get one that has a remote receiver, as you may be in the kitchen cooking while your child may sneak out of the house for some fun at the pool. Note that pool alarms are not meant to replace any other safety measures such as adult supervision, fences, gates, locks, etc. They are intended to be an additional layer of security to protect your children and alert you of any potential accidents, if you happen to be away from the pool. 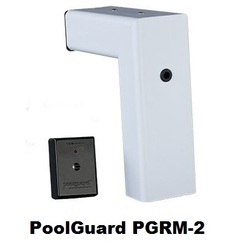 This article will compare PoolGuard PGRM-2 and Pool Patrol PA-30 pool alarms. At the time this article was written these were the most popular pool alarms equipped with a remote receiver and have also received some excellent reviews from Amazon buyers. Note that if your pool is larger than 800 sq-ft, you may need more than one pool alarm installed. In that case, you should position the two pool alarms as far from each other as possible to cover as much of the pool square-footage as possible. The receiver works with the pool alarm allowing you to monitor your pool from within your house. When the alarm is activated, the transmitter sends a signal to activate the receiver. Both the PoolGuard and Pool Patrol pool alarms come with an in-house remote receiver that has a range up to 200 ft and a power supply. Note that it is best to place the receiver next to a window or door within 200 feet from the transmitting pool alarm. It should not be placed near steel walls, on an electrical appliances, or on a metal surface as this could degrade signal reception. And it should be placed at an elevation higher than the top of the pool. Both the PoolGuard and Pool Patrol pool alarms work on a 9-volt battery which is not included in the purchase (see Amazon products section below for 9-V batteries). The battery life is approximately one year. The PoolGuard alarm is equipped with an audible low battery indicator. When the battery voltage gets low, the receiver will beep approximately once every 10 seconds to indicate the problem. The Pool Patrol alarm is also equipped with an audible low battery indicator. If the 9V battery drops below 6V, it will sound a “chirp” once every minute. The receiver will also chirp once every minute to indicate the alarm in the pool has a low battery. On the Pool Patrol alarm, turning the black flotation base clockwise or counterclockwise will raise or lower the position of the sensing ring with respect to the water. The closer the sensing ring is to the water, the more sensitive the alarm. 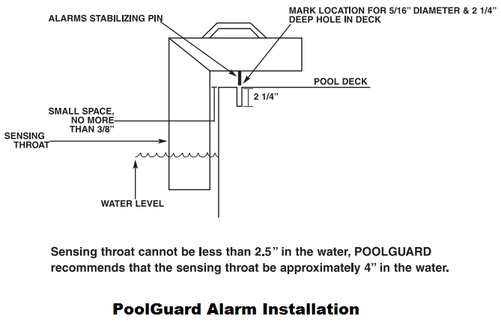 There is no sensitivity adjustment on the PoolGuard alarm, but the unit uses built-in sensing technology that makes it quite reliable with regards to sounding the alarms when required and avoiding false alarms due to wind, rain or small objects such as sticks or toys entering the water. Installing the Pool Patrol alarm is simpler as it simply floats on the surface of the pool. To keep it in place where it is placed to float, it provides some self-stick hooks that stick to tile and some string that is used to attach the floating unit to the hooks. But with Pool Patrol, adjustment of the sensitivity of the alarm is part of of the installation procedure, and that may take some time. Since the Pool Guard alarm is installed by the pool deck, a solar cover can easily be used simultaneously with no problems. Though the Pool Patrol alarm is a floating unit, it can also work with solar covers. All you will need to do is cut an area out of your cover making a ½ circle shape large enough for the alarm to float freely, fold the ½ circle over to expose the pool water, and carefully place the alarm in the ½ circle of exposed water. You may also have to adjust the sensitivity of the alarm. The indicated prices are Amazon prices that may include a large discount on the list prices. When you click the product images in the Amazon products section below, if a discount is available, both the list price and the Amazon price will be shown. Note that the prices shown were in effect at the time this article was written and may have changed. So which of the two pool alarms to buy? 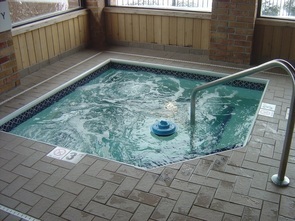 While Pool Patrol allows you to adjust the sensitivity of the unit to waves, PoolGuard does not, but instead it has built-in sensing technology that makes it quite reliable with regards to sounding the alarms when required and avoiding false alarms due to wind, rain or small objects such as sticks or toys entering the water. Many users have reported that PoolGuard was very reliable and worked as it should. But clearly, though it may be preferable to have a unit that does not need to be adjusted until it works properly, there may be instances where external factors are such that adjustment of sensitivity is required to get the unit working properly, as no device can be hundred per cent fool proof. So both designs have their merits, and it is up to you to decide which would fit best your pool’s environment. From an installation point of view, Pool Patrol is simpler since it does not require drilling a hole on the pool deck, but once again, with Pool Patrol, adjustment of the sensitivity of the alarm is part of of the installation procedure, and that may take some time. Keep also in mind that though the PoolGuard installation requires drilling a hole, it is more stable and can be less easily tempered with than the Pool Patrol alarm. PoolGuard can only be used with in-ground pools, while Pool Patrol can be used both with in-ground and above-ground pools. Finally note that PoolGuard has a better warranty than Pool Patrol (3-Year vs. 2 Year). 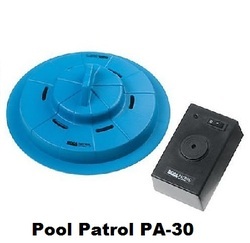 For in-ground pools, overall, we prefer Pool Guard over Pool Patrol, because we think it’s better to have an alarm device that is reliable enough not to require the user to adjust the sensitivity of the unit until it works properly, because it has a more stable installation that can not be easily tempered with, and because of its better warranty.